The evidence for stress contributing to the onset and course of autoimmune disease is circumstantial and the mechanisms by which stress affects autoimmune disease remain poorly understood. The best evidence for an effect of stress on the development of an autoimmune disorder is the well-known relationship between the clinical onset of Graves’ hyperthyroidism, and its subsequent clinical course, and major stress in the preceding 2-3 months. The role of stress in the development of the ophthalmopathy which is associated with Graves’ hyperthyroidism is much more complicated and difficult to study. Stress may be the major environmental factor in most patients who develop Graves’ hyperthyroidism but there are other factors as well such as smoking, vitamin D deficiency and infections. Although future studies to tease out the role of all of these components will be difficult they must be carried out and we need to be patient. Psychological and physiological stress is possibly a major environmental trigger to autoimmunity in subjects with a genetic predisposition denoted by a family or personal history of the same. The best evidence for an effect of stress on the development of an autoimmune disorder is the well-known relationship between the clinical onset of Graves’ hyperthyroidism (GH), and its subsequent clinical course, and major stress in the preceding 2-3 months (reviewed in Reference 1). Human and animal studies have demonstrated that psychological and physiological stressors induce various immunologic changes, including changes in T-helper (Th)1/Th2 cell ratios [2,3]. Stress is presumed to affect the immune system indirectly through the various nervous and endocrine systems rather than directly and these immune modulations may contribute to the development of autoimmunity in genetically predisposed individuals. However, because of the complexity of the stress reactions involving not only various parts of the brain and hypothalamic-pituitary-adrenal (HPA) axis, but also many other minor and major hormones and the immune system itself, it will always be difficult to tease out the various components as the basis for setting up animal and in vitro models. The best we can do is to characterize the major stressors and to quantify their effects on the clinical features, immune parameters and endocrine changes in patients with autoimmunity, taking as a good model, GH. While many studies have shown a connection between stress and autoimmune disease, most of the evidence for stress contributing to the onset and course of autoimmune disease is circumstantial and the mechanisms by which stress triggers the development of autoimmune disorders remain poorly understood. GH and Hashimoto’s thyroiditis (HT) are two well-studied entities of autoimmune thyroid disease (AITD), where genetic and environmental factors are thought to contribute to the development of the disorder. Potential environmental risk factors for AITD include high dietary iodine intake, selenium and vitamin D deficiency, tobacco smoking, certain medications, hepatitis C virus infection and possibly stress [4, 5]. One study suggested that genetic predisposition accounts for approximately 80% of the liability to develop GH, while non-genetic and environmental factors account for the remaining 20% . In humans, acute stress has been associated with the development of GH as suggested by the 5-fold increase in the incidence of GH during the civil war in Eastern Serbia . In other studies, GH patients reported a greater number of negative or stressful life events before the diagnosis [8, 9, 10], whereas chronic daily stress and personality traits may contribute to higher TSH-receptor antibody levels and increase the risk of GH relapse after initial remission with antithyroid medications . The relationship between stress and HT is less obvious possibly because the autoimmune reaction goes on for many years before the diagnosis of clinical hypothyroidism, making it difficult to link the onset of the illness to stressful life events. However, in one epidemiological study chronic stress due to post-traumatic stress disorder was associated with HT and GH, as well as other autoimmune disorders such as rheumatoid arthritis and type 1 diabetes mellitus . The role of stress in the development of ophthalmopathy which is associated with GH  is of great interest to the authors , but much more complicated and difficult to study. Orbital inflammation is linked to the thyroid autoimmune reaction in about 50% of patients with GH and 25% of patients with HT, where the eye signs are much less severe and present predominantly with itchiness, grittiness and upper eyelid retraction . Apart from thyroid autoimmunity, smoking is an important risk factor for ophthalmopathy in patients with GH [16, 17]. While there are other possible reasons why smoking may precipitate eye disease in patients with GH – such as a direct effect on the orbital tissues or through the multitude of toxic agents inhaled –stress is likely to play a role. Most patients with ophthalmopathy are diagnosed at the time of the onset of hyperthyroidism suggesting that stress may trigger both disorders; however only some patients develop the eye disease. We have recently identified possible genetic markers for ophthalmopathy including three single nucleotide polymorphisms (SNPs) in the CASQ1 gene which are associated with ophthalmopathy in patients with GH and HT (Lahooti, Cultrone and Wall, unpublished observations), and we can address the relationship between these SNPs and stress in a prospective study of patients with newly diagnosed thyroid autoimmunity. Another good model for studying the effects of stress on the immune system is type 1 diabetes mellitus where one or more positive circulating antibodies to islet cells, tyrosine phosphatase, insulin, zinc trasporter-8 and glutamic acid decarboxylase 65, indicate strong predisposition to the disorder [18, 19]. More than 95% of subjects developing hyperglycaemia and overt diabetes mellitus will have at least one detectable autoantibody. The trigger for the final decompensation of the beta islet cells remains unknown although chronic stress may play a role . The period from initial islet cell autoantibody detection until the development of hyperglycaemia provides a unique opportunity for studying the impact of various life stressors on the progression of type 1 diabetes mellitus. 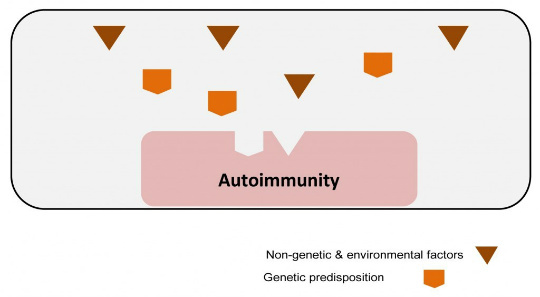 As demonstrated in Figure 1, the development of autoimmunity in humans is the endpoint of a complex process involving the immune system, hormonal and environmental factors in a genetically predisposed individual, hence the term ‘mosaic of autoimmunity’ . Figure 1. Mosaicism of autoimmunity. 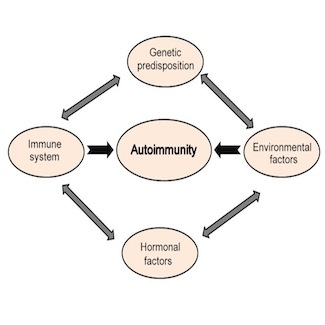 Interplay of different factors that lead to the development of human autoimmunity. Adapted from Reference . Despite the central role of genetic predisposition in this process, interplay between genetic and non-genetic factors seems essential for the development of full-scale autoimmune reaction (Fig. 2). Figure 2. Interplay of genetic predisposition and non-genetic and environmental factors in the development of autoimmunity. The presence of one factor without the other may not be sufficient for the development of full-scale human autoimmunity. In animal studies, acute stress is associated with increased serum glucocorticoids and catecholamines, and shifting of the CD4 T-lymphocyte cell balance in favour of Th2 rather than Th1 with increased humoral immunity and decreased cellular immunity. In chronic stress animal models, the serum glucocorticoids and catecholamines return to normal, while the serum thyroid hormones (T3 and T4) are significantly reduced and the Th1-Th2 balance is shifted in favour of Th1 with increased cell-mediated immunity and autoimmune thyroiditis. It is interesting that these changes can be reproduced by antithyroid medications in the absence of stress and reversed by thyroxine treatment in the presence of chronic mild stress, suggesting that changes in thyroid hormone levels directly affect the immune system and the development of autoimmunity [21, 22]. It is likely that similar changes occur in response to stress in humans. A well-studied example of this is pregnancy which is associated with reduced Th1 activity and unchanged or increased Th2 (humoral) immunity. After delivery, the normalisation of Th1 activity is thought to increase the risk of post-partum thyroiditis in predisposed women . In patients with GH, the paradoxically quiescent disease activity during pregnancy despite augmentation of humoral immunity may be related to the development of blocking TSH-receptor antibodies that gradually decline in the post-partum period . How can we study the role of stress in these patients in an objective manner? 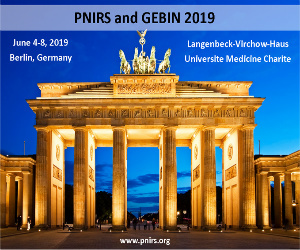 As psychosocial stress becomes more and more an inevitable part of living in the 21st Century, it is important to determine the effects of stress on the development and propagation of autoimmune disorders and a new approach to its study needs to be developed. We are presently studying the relationship between various risk factors for Graves’ ophthalmopathy, including smoking, vitamin D level, age, iodine status and stress, and SNP rs3838216 in the CASQ1 gene, compared to control subjects with no personal or family history of thyroid autoimmunity. To investigate the role of stress as a trigger for the onset of autoimmune end-organ dysfunction, it would be ideal to carry out prospective controlled studies in patients with positive autoantibodies before the onset of organ decompensation. The latter includes normoglycaemic subjects with one or more positive islet cell autoantibodies, GH patients who are in remission after treatment with antithyroid medications, and euthyroid women with a history of transient post-partum thyroiditis who have a 50% chance of developing overt hypothyroidism over the next 7 years . These patients can be followed prospectively and asked to keep a weekly diary of the various life stressors they experience. Quantitative organ-specific autoantibody levels can also be measured to determine if there is a relationship between stress levels and progression of autoimmunity, as previously demonstrated in patients with GH in remission . Almost all patients with newly diagnosed GH can identify a period of severe stress within the 3-6 months period preceding the diagnosis suggesting that stress plays a major role in the development of hyperthyroidism in genetically predisposed individuals. However, stress is surely not the only environmental factor and there are other factors such as smoking, vitamin D deficiency and infections. Future studies to tease out the role of all of these components will be difficult but they must be carried out. Mizokami T, Wu Li A, El-Kaissi S, Wall JR. Stress and thyroid autoimmunity. Thyroid. 2004 Dec; 14 (12): 1047-55. Guo J, Rapoport B, McLachlan SM. Balance of Th1/Th2 cytokines in thyroid autoantibody synthesis in vitro. Autoimmunity. 1999; 30 (1): 1-9. Tsatsoulis A, Limniati C. The Modifying Role of Stress-Induced Th2 Shift in the Clinical Expression of Thyroid Autoimmunity: A Brief Overview and Unifying Hypothesis. 29 August 2012: BrainImmune.com; Date accessed 14 Dec 2012. Tomer Y, Huber A. The etiology of autoimmune thyroid disease: a story of genes and environment. J Autoimmun. 2009 May-Jun; 32 (3-4): 231-9. Klecha AJ, Barreiro Arcos ML, Frick L, Genaro AM, Cremaschi G. Immune-endocrine interactions in autoimmune thyroid diseases. Neuroimmunomodulation. 2008; 15 (1): 68-75. Brix TH, Kyvik KO, Christensen K, Hegedus L. Evidence for a major role of heredity in Graves’ disease: a population-based study of two Danish twin cohorts. J Clin Endocrinol Metab. 2001 Feb; 86 (2): 930-4. Paunkovic N, Paunkovic J, Pavlovic O, Paunovic Z. The significant increase in incidence of Graves’ disease in eastern Serbia during the civil war in the former Yugoslavia (1992 to 1995). Thyroid. 1998 Jan;8 (1): 37-41. Matos-Santos A, Nobre EL, Costa JG, et al. Relationship between the number and impact of stressful life events and the onset of Graves’ disease and toxic nodular goitre. Clin Endocrinol (Oxf). 2001 Jul; 55 (1): 15-9. Winsa B, Adami HO, Bergstrom R, et al. Stressful life events and Graves’ disease. Lancet. 1991 Dec 14; 338 (8781): 1475-9. Yoshiuchi K, Kumano H, Nomura S, et al. Stressful life events and smoking were associated with Graves’ disease in women, but not in men. Psychosom Med. 1998 Mar-Apr; 60 (2): 182-5. Fukao A, Takamatsu J, Murakami Y, et al. The relationship of psychological factors to the prognosis of hyperthyroidism in antithyroid drug-treated patients with Graves’ disease. Clin Endocrinol (Oxf). 2003 May; 58 (5): 550-5. Boscarino JA. Posttraumatic stress disorder and physical illness: results from clinical and epidemiologic studies. Ann N Y Acad Sci. 2004 Dec; 1032: 141-53. Lahooti H, Parmar KR, Wall JR. Pathogenesis of thyroid-associated ophthalmopathy: does autoimmunity against calsequestrin and collagen XIII play a role? Clin Ophthalmol. 2010; 4: 417-25. Wall JR, Lazarus J. Caleb Parry and the Relationship between Hyperthyroidism and Stress. 29 October 2009: BrainImmune (www.brainimmune.com); Date accessed 14 Dec 2012. Tjiang H, Lahooti H, McCorquodale T, Parmar KR, Wall JR. Eye and eyelid abnormalities are common in patients with Hashimoto’s thyroiditis. Thyroid. 2010 Mar; 20 (3): 287-90. Hegedius L, Brix TH, Vestergaard P. Relationship between cigarette smoking and Graves’ ophthalmopathy. J Endocrinol Invest. 2004 Mar; 27 (3): 265-71. Tellez M, Cooper J, Edmonds C. Graves’ ophthalmopathy in relation to cigarette smoking and ethnic origin. Clin Endocrinol (Oxf). 1992 Mar; 36 (3): 291-4. Merger SR, Leslie RD, Boehm BO. The broad clinical phenotype of Type 1 diabetes at presentation. Diabet Med. 2012 Oct 17; [Epub ahead of print]. Zanone MM, Catalfamo E, Pietropaolo SL, et al. Glutamic acid decarboxylase and ICA512/IA-2 autoantibodies as disease markers and relationship to residual beta-cell function and glycemic control in young type 1 diabetic patients. Metabolism. 2003 Jan; 52 (1): 25-9. De Carvalho JF, Pereira RM, Shoenfeld Y. The mosaic of autoimmunity: the role of environmental factors. Front Biosci (Elite Ed). 2009; 1: 501-9. Silberman DM, Wald M, Genaro AM. Effects of chronic mild stress on lymphocyte proliferative response. Participation of serum thyroid hormones and corticosterone. Int Immunopharmacol. 2002 Mar; 2 (4): 487-97. Frick LR, Rapanelli M, Bussmann UA, et al. Involvement of thyroid hormones in the alterations of T-cell immunity and tumor progression induced by chronic stress. Biol Psychiatry. 2009 Jun 1; 65 (11): 935-42. Lazarus JH. Thyroid disorders associated with pregnancy: etiology, diagnosis, and management. Treat Endocrinol. 2005; 4 (1): 31-41. Kung AW, Jones BM. A change from stimulatory to blocking antibody activity in Graves’ disease during pregnancy. J Clin Endocrinol Metab. 1998 Feb; 83 (2): 514-8. Source: Cover Image: Histopathological image of diffuse hyperplasia of the thyroid gland clinically presenting as hyperthyroidism. Credit: Wikimedia Commons.